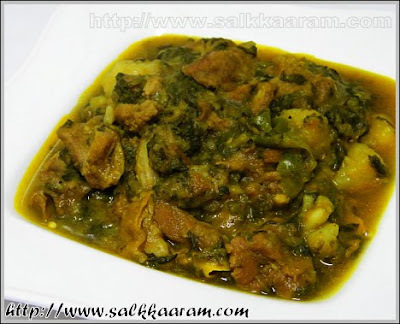 Mutton-Aloo-Palak / Spinach With Mutton And Potatoes | Simple and Delicious ! Three healthy ingredients in one dish! Yeah, here you have one such. If I start writing about spinach / palak it will make my post so lengthy. A very very healthy vegetable, with lots of nutrients cooked with mutton and potato, am sure you will never say no to this dish. I hadn't much expectation before preparing this, but surprisingly the whole dish finished soon! Before you buy leaves check the leaves are fresh or not. Buy deep green leaves with tender stems with no signs of yellowing. Soak the whole leaves in a large vessel of water, clean each leaf dipping in that and remove dirts and soil. Change the water and continue cleaning until you find there is no dirt or soil remains in the washed water. Two or three times will be enough. Then cut the hard stems and chop the leaves and cook for 1 minute. Water shouldn't be used to cook spinach, because the leaves already produce enough water while cooking. Grind garlic-ginger-cumin seeds together to a paste. Cook palak / spinach with salt without adding water. Cook on a low flame. Mash it using a ladle after cooked well. Heat little oil in a heavy bottomed vessel. Saute chopped onions till transparent. Add ginger-garlic-cumin paste and saute for some time. Add all the powders,chopped tomatoes and mutton. Stir continuously and cook for some time. Mix well and cook covered on a medium flame. No need to add water, since water comes from the spinach. When the mutton is half cooked, put the potato pieces and slit green chillies into it. Mix well and cook until done. I transferred all the contents to a pressure cooker and completed cooking in that. When everything cooked well, you get a thick gravy. Sprinkle little garam masala over it. While cooking add water only if needed. This would be good with rice, roti or chapathi. Don't worry about losing the vitamins by over cooking spinach, you can take a delicious dish instead..
Beautiful and yumm. I wish i got mutton here. I am regular reader of your blog.Mutton Aloo Palak great comb...a quite different one...looks yummy....very innovative..
Palak in mutton....very new to me. Seena, this is a great recipe. I love mutton:) so needless to say, I am saving the recipe:) Thank you! kothi sahikkan vayya..ivide nalla mutton kittilla..nattile polathe..:(.. I will definitely try this combo. 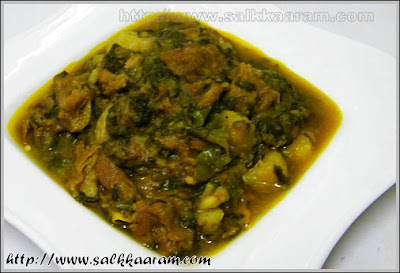 mutton with spinach. i have taken this dish from a pakistani restaurant years ago. i told my wife this morning about this,she said she will try to cook for me. perunnalu varikayaanallo. ithu vechu tharaamengil perunnalinu varaam. Love mutton in any form :) This looks yummy! Love all your recipes. You are a big inspiration for me in starting my own blog. I just started it.I would really appreciate if u take a look at it. Will be great to get advice from an expert like you. I prepared this by adding steamed and blended spinach at the end... It was delicious ..kids also loved it a lot.. Thanks for the recipe..